An absorbing account of how American medicine was changed forever by the efforts to bring good medical care to men on the battlefields of the Civil War. Rutkow (Clinical Surgery/Univ. of Medicine and Dentistry of New Jersey), the author of several histories of surgery, focuses here on medical care on the Union side during the Civil War, for it was the Northern experience, he notes, that most affected the future practice of American medicine. He paints a vivid picture of the state of medicine before the war, when medical schooling was haphazard, a hodgepodge of therapies vying for supremacy. While no great scientific innovations occurred during the Civil War era—germ theory came later, and anesthesia was still largely unavailable—the war brought discipline and standards to a fractious profession and transformed the administration and organization of military medical care. In particular, Rutkow tells the story of the powerful United States Sanitary Commission, a civilian relief agency established at the start of the war. Under the guidance of Frederick Law Olmstead, the Commission set standards for military camp sanitation, advocated an independent ambulance service, and fought for a strong Surgeon General, William Hammond. Among Hammond’s successes was the reform of the US Army’s Medical Department and the redesign of military hospitals, changing forever the public’s notion of what a hospital could be. While Rutkow captures the sweep of action on battlefields and the bloody aftermath of battles, he also reveals the political infighting that went on at the same time. His cast includes politicians with personal grievances, generals with petty animosities, doctors and nurses with ambitions and jealousies, and, of course, soldiers with gruesome wounds. 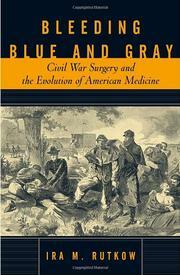 Great storytelling that both Civil War buffs and fans of medical history will surely relish.